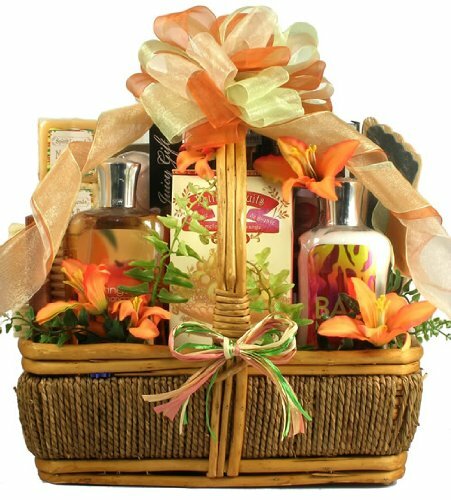 This tropical spa basket with gourmet treats has everything she needs for a relaxing, self pampering day of indulgence. All she needs now is the sand and steel drums and it's a vacation. This stunning gift basket is perfect for any occasion. This tropical spa gift basket includes: mango mandarin (10 ounce) shower gel bali mango (8 ounce) body lotion two sided wooden manicure brush wooden pedicure groomer gift set with coconut citrus, mandarin mango, pomegranate peach, shower gels and bath fizzers Belgian chocolate seashells mango rum fudge coconut rum fudge milk pistachio chocolate bar white chocolate coconut truffle bar Swiss petite candies white chocolate macadamia cookies almonds and sea salt dark chocolate bar sunshine fruit tropical fruit mix tropical fruit flavored bonbons this luxury personal spa day gift basket is sure to be well received for almost any occasion you can think of.